Having arrived at the autograph signing area the moment it opened, none of the Babylon 5 Cast were there yet. I got an autograph from Corin Nemec (Jonas on Stargate SG1) and marveled at the lines for Tom Felton (Draco on Harry Potter) and David Prowse (Darth Vader). Coming back, I was stunned to see a massive line for Bruce Boxleitner, and just a few people standing in front of the tables for Peter Jurasik (Londo) and Stephen Furst (Vir). They had some cool-looking Babylon 5 banners behind them, conventions have really come a long way and are now a bit mechanized. But it was great to see them after all these years. I told Peter Jurasik I had met him at the 1999 Atlanta Dragoncon. Then, there were a good number of women wearing skull caps and centauri costumes, and I noted he had flirted with them in his Londo accent. He laughed that big Londo laugh and said "Of course! They're women!" I mentioned to him that I was one of the few people who had seen the original Tron at the movie theater, twice. So he made my autograph out for that achievement (he played the program Crom, an early victim of the Ring Games). I wanted a second autograph for his Londo character, he said a fan in Europe had made beautiful lithographs of Londo and Vir, so I now own a copy. Stephen Furst was a little under the weather, having his ankle in a cast, but he had that great smile that fans love him for. He had a great picture of the Babylon 5 cast giving the finger to the camera (on news of not getting a syndicated renewal after season 4, so it has Claudia). I told him about the episode that I found most interesting for Vir's character, where Londo was explaining the sword-fighting traditions to him. Most science fiction (like Star Trek) assumes everyone on one planet knows everything about that planet. As Londo explained this to Vir, I saw that Vir and Londo could be from the same planet, but very different cultures and societies. Stephen said of course, this is why he and Peter Jurasik had different accents! Finally getting in Bruce Boxleitner's line, I stood for over 30 minutes as we nervously crept closer to Bruce, and the starting time for the Babylon 5 discussion panel. Bruce was very nice to every visitor, posing with every child for pictures. Fortunately, I got through and got my picture taken with him. Bruce noticed me wearing my old Claudia Christian "IVanova is God" t-shirt they made back in the nineties. Through countless washings, it was still suitable for wear. I was kind of surprised it has made it from the 1999 Dragoncon to the 2012 Megacon. Bruce looked at the shirt first and said, "Claudia! ", noting that she was doing a convention in Belfast Ireland with Patricia Tallman, and that Claudia had said it was the worst convention with nobody showing up to see them. I had him sign a Captain Sheridan picture taken from roughly the time of the "Lost Tales" final Babylon 5 movie. I told him that the Sheridan character was an inspiration to me in my own life to do the right thing. I told Bruce I had the same first name as Sheridan, but added I was no Captain Sheridan. Bruce said "No kidding, I had a hard time myself". I also told him I had enjoyed the PAX Three Musketeers series he had done after Babylon 5, he said they had trouble getting it off the ground, but "these were good shows". I also told him that when they announced after the Season 1 summer break that Bruce Boxleitner would be joining the cast as the new captain, I felt it was a natural fit. Bruce opined, "You think that? There were some that didn't". Lucky to get to see Bruce before they cut off his line, I got in line to the Babylon 5 panel. This was conducted by the same Megacon official that had conducted the Mira Furlan panel from last year's Megacon. Last year, fans were a bit miffed that the panel host monopolized all the questions for Mira, at one point making her cry by repeatedly bringing up the various Babylon 5 actors who had died. This year, to my relief, the panel host shut up for the panel discussion and only asked one question at the end. Stephen Furst, Peter Jurasik, Cindy Morgan (TRON, Caddyshack), and Bruce Boxleitner made their respective entrances. Thinking ahead this convention, I brought my audio recorder with me to record the panel discussion. Stephen and Peter were at the far end of the room, so will sound fainter. Bruce and Cindy were directly in front of me, so they sound much clearer. And of course, Bruce is well-trained to project his voice across the room, what a great voice that guy has. I apologize for various noises as I adjusted my position while recording. Although some audience questions are faint, you can hear most of them as well. When Bruce mentions the people right in front of him, he is referring to a bunch of middle-aged women who were very loudly fans of "Scarecrow and Mrs. King". I was sitting just off to the side of the middle, so had great audio of the panel from the front row. Bruce's and Peter's humor really helped keep the discussion light, and they managed to touch on the friends who have "passed beyond the rim" as well. A great panel event to be at, and I was personally glad some questions got tossed to Cindy Morgan, as several fans had "Babylon 5 tunnel vision". Several fans asked very narrow questions that would have prompted me to say "You're asking about my character on Babylon 5, right? Because I've done theater, other movies, it's not my whole life work". But the stars were very patient with such questioning. Pay attention to Bruce's reaction to Stephen Furst's claim that he was not a real Babylon 5 star, and Peter's reaction to Bruce having a small part on TRON Legacy. Funny guys! So enjoy, and I hope this recording prompts those who hear it to see their stars in person at their nearest convention. As Pat Tallman noted on her blog, the stars do not make a river of money on these conventions, it's a great inconvenience to them in their personal lives to pack up and go to these. So go to the conventions, buy an autograph, and thank them for their work. A TRON fan brought a children's TRON Legacy hat, so Bruce braved the unknown and put the guy's hat on. Cindy Morgan (his co-star in the original TRON) was at the far end of the Babylon 5 signing tables, so he called out "Hey Cindy, look!" as he put on the hat for her to look at. My final panel pictures are of Bruce and Peter hugging and shaking hands, having not seen each other for awhile I suppose. Great to see such friendship over the years! First, thanks for the great reporting job. I don't know what Claudia expected, in Ireland, 14 YEARS after Babylon 5 finished its original airings. In London, I bet they'd have gotten a better turnout. I don't know how much trouble it is to get to Belfast from mainland Europe, but I imagine London's certainly an easier destination, given the under-channel, train tunnel. Still, without something new in the production pipeline, B5 fan attendance at conventions is bound to tail off. The whole situation, with nothing in the Babylon 5 universe able to really get off the ground since the series ended in 1998, and our beloved stars appearing at conventions with nothing new in the Babylon 5 universe to promote, is just plain SAD. Warner Brothers is mainly to blame for this. Back in 2001, Crusade was the natural pick-up point for stories in the Babylon 5 universe, but The Sci-Fi Channel (US) and Warner Brothers dropped the ball, The Sci-Fi Channel (US), now Syfy. went insane, wanting to distance themselves from science-fiction, and Warner Brothers has been fumbling the B5/Crusade ball constantly for the past 11 YEARS. Having discovered Babylon 5 with Season 3 Episode 21, watching through to the end of Season 5, and then starting around at the beginning and watching it straight through to the end , the movies and Crusade, the transition from Sinclair to Sheridan looked natural and story-driven, to me. <shrug> I like both Sinclair and Sheridan. Thank you for the kind comments! It was amazing to get some fresh feedback on Babylon 5 from the cast. Given Claudia's comments on the Ireland turnout, there is huge unemployment in Ireland these days, so people may not have a lot of money to spend on conventions there. I think Bruce got a text or so from Claudia on that, so maybe it was just a momentary thing, and more people showed up later. What I took from Bruce's comments is that it is great that he and Claudia are on such close terms after all these years. You are quite right on the SyFy channel. I remember how that new boss cancelled Farscape, and then immediately transferred out of there to another executive position at some other company. But the damage was done. I just bought the new complete boxed set of Farscape, so can now enjoy the series in its entirety. They did nothing with the property, however. 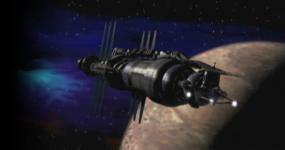 Likewise, Warner Brothers could definitely revisit the Babylon 5 universe. Bruce mentioned The Telepath Wars, how about starting there, Warner Bros? Season three was a great place for you to start the series! I started from the very beginning, watching the cheesy first season and enjoying the contrasts from the big money shows that were clogging the airwaves at the time. KoshN, I think you will really enjoy the MP3 download I include of the panel discussion. There's a lot of meat there discussed by everyone, I was glad to see such enthusiasm and humor from the cast. Last edited by VeriBaldi; February 26th 12 at 22:15. The Sci-Fi Channel renewed Farscape for TWO seasons, and then cancelled the last one a short time later. Then, due to fan uproar, the three-hour, wrap-up miniseries was made. Actually, Bonnie Hammer got PROMOTED out of her job as the head of The Sci-Fi Channel, one of her like-minded cronies was put in her old spot as head of The Sci-Fi Channel, and then the channel was renamed Syfy and they all expresssed an interest in distancing themselves from science-fiction, like science-fiction was not to be taken seriously, and was only for stereotypical manchildren living in their mothers' basements. Bonnie Hammer was then put in charge of both The Sci-Fi Channel/Syfy and USA Network, and then she was promoted AGAIN, this time being put in charge of all NBC/Universal cable programming. At least, she hasn't metastasized to all NBC/Universal programming. I just bought the new complete boxed set of Farscape, so can now enjoy the series in its entirety. They did nothing with the property,however. That's no surprise. The aim is to squeeze as much money out of the fans while expending as little money and effort as possible. I'm surprised that Warner Brothers hasn't come out with a Blu-Ray version of B5 that actually looks worse than the current DVDs, in an effort to squeeze a bit more money out of the fans. Likewise, Warner Brothers could definitely revisit the Babylon 5 universe. Bruce mentioned The Telepath Wars, how about starting there, Warner Bros? Like I said, Warner Brothers doesn't realize what a GREAT thing they have with the Babylon 5 franchise. Every few years they throw a crumb Babylon 5/JMS's way, marvel at how it did better than they expected, and then lose interest for a few years. I was coming from Trek (DS9 and Voyager), watched "Shadow Dancing" and found Babylon 5 to be many orders of magnitude better than DS9 or Voyager. The only reason I went back to Trek with Enterprise was because it was one of the few space sci-fi programs on the air. Then, I dropped Enterprise after watching the Season 3 finale, the last 7 minutes, space Nazis??? ARGH! Years later, I watched Enterprise Season 4, and Manny Coto (sp?) managed to come back from the awful ending of the Season 3 finale and make a good season, and then Berman and Braga flipped-off the fans with the Season 4 finale. I didn't watch "Star Trek" (2009) until it came out on DVD. I (foolishly) bought the DVD, watched it, and then immediately sold it. To this day, I have ZERO interest in Trek and have none of it on DVD. Sadly, there will be nothing new on the Babylon 5 or Crusade front, and that comprises 100% of my interest. Now, the only things I have to look forward to are "Crusade - What The HELL Happened?" - Volumes 2, 3 and 4, if and when those books ever come out. I don't know what Claudia expected, in Ireland, 14 YEARS after Babylon 5 finished its original airings. In London, I bet they'd have gotten a better turnout. I don't know how much trouble it is to get to Belfast from mainland Europe, but I imagine London's certainly an easier destination, given the under-channel, train tunnel. FYI, Belfast was the second con that Pat and Claudia attended. The first was in London the week before. Thanks also for the report. I live in the area but avoid MegaCon on Saturdays and then wasn't feeling well on Sunday when I'd planned to go. Major bummer. Downloading the audio file, now. Last edited by Jan; February 27th 12 at 01:08. I guess fan showing at the London convention was more to Claudia's liking/expectations. I have just purchased the tiny 13-episode DVD boxed set, so will watch Crusade for the first time. I think it was a matter of packaging. If they named the new series "Babylon 5 - The Telepath Wars", and kept some more original cast members, it might have had a better shot. Unproven cast, unproven premise (Earth is plagued? ), and no promotion from TNT. I think it was a matter of packaging. If they named the new series "Babylon 5 - The Telepath Wars"
But Crusade takes place after the Telepath War. and kept some more original cast members, it might have had a better shot. It would have had a better shot if TNT hadn't canceled it before it had aired a single episode, and then deliberately aired it out of sweeps period so even if it had rated high it would be meaningless. Well, I certainly look forward to watching the boxed set.